To Cite: Navarro Suay R, Tamburri Bariain R, Castillejo Perez S, Garcia Aroca M A, Bodega Quiroga I, et al. Anesthesiologic and Surgical Experiences of the Spanish Role 2 Enhanced in Herat, Afghanistan, J Arch Mil Med. 2015 ; 3(2):e26799. doi: 10.5812/jamm.3(2)2015.26799. Background: In 2001 the Council of Ministers of the Kingdom of Spain authorized the participation of Spanish military units in the International Security Assistance Force (ISAF) in support of the Afghan government. Four years later, Spain assumed control of the Forward Support Base in Herat (Afghanistan). Because of its capabilities, personnel, and equipment NATO considered it as the medical reference installation for the four provinces that form the western region of Afghanistan. Objectives: The current report aimed to describe anesthesiology and surgical experiences of Role 2 Enhanced (Role 2E) in heart, Afghanistan, from March to May 2014. Patients and Methods: An observational, descriptive, retrospective study was conducted from March to May 2014. The civilians and military personnel wounded by firearm or explosive detonation in western Afghanistan, who were treated at the Role 2E in herat were included. There were no exclusion criteria. Results: Seven hundred and forty five patients including 181 Afghan civilians, 82 non-Afghan civilians, 24 Afghan police and military, and 458 military ISAF, were treated during the study period. There were 10 combat casualties among them. All patients were male and aged 25-30 years; seven had been injured by an explosive and three by firearm; five with head-neck wounds, two with wounds in the upper limbs, two in the abdomen, one in the thorax, and one in the lower limbs. The New Injury Severity Score (NISS) was one mild, five moderate and four severe. There were 14 surgical patients (seven wounded in combat and seven non-combat casualties, and 12 patients were admitted to the Intensive Care Unit (ICU). None of them died. A total of 12 general anesthesias, 11 regional anesthesias (three intradural anesthesias, three interscalene blocks, one axillary block and four femoral blocks) and six local anesthesias with sedation were performed. Conclusions: During the study period, 745 patients were treated, including 10 combat casualties. Twelve general anesthesias, 11 regional anesthesias (three intradural anaesthesias, three interscalene blocks, one axillary block, four femoral blocks), and six local anaesthesias with sedation were performed. Twelve patients were admitted to the ICU. These anesthesiological and surgical experiences can be helpful in future military deployments. Copyright © 2015, AJA University of Medical Sciences. This is an open-access article distributed under the terms of the Creative Commons Attribution-NonCommercial 4.0 International License (http://creativecommons.org/licenses/by-nc/4.0/) which permits copy and redistribute the material just in noncommercial usages, provided the original work is properly cited. In 2001 the Council of Ministers of the Kingdom of Spain authorized the participation of Spanish military units in the International Security Assistance Force (ISAF) in support of the Afghan government. Four years later, Spain assumed control of the Forward Support Base in heart, Afghanistan. Within this base there was a second medical echelon Role 2 Enhanced (Role 2E) manned by a staff of 50 people from four different nationalities (Spanish, American, Emirati, and Afghan). The total area of health assistance facilities covered almost 2,000 m2 and included 100 containers (20´ feet). The main facilities in the Role 2E were: a triage room, two wards (six beds), an intensive care unit (four beds) (Figure 1), three operating rooms (Figure 1), sterilization room, imaging room with Computed Tomography (CT), a laboratory, dentistry consultation, pharmacy, oxygen plant with O2 production and storage capacity, and a telemedicine room. Because of its capabilities, personnel and material NATO considered it as the reference medical installation for the four provinces that form the western region of Afghanistan (Badghis, Heart-Italian Role 1-, Chaghcharan, Farah) (1, 2). Surgical and anesthetic treatments lent especially to combat casualties were largely developed by Spanish military doctors a few decades ago (3-5). However, despite continues involvement of Spanish medical officers in operations abroad, the issue is not reviewed in the recent years. An adequate anesthetic technique, proper airway and bleeding control, under damage control resuscitation principles with an early pain and infection treatment, and a suitable monitoring can improve casualty safety and allow research in battlefield. The current report aimed to describe anesthesiologist and surgical experiences of the Role 2E in heart, Afghanistan, from March to May 2014. An observational, descriptive, retrospective study was conducted from March to May 2014. All the civil and military personnel wounded by firearm or explosive detonation in western Afghanistan, treated at the Role 2E in Herat were recruited. There were no exclusion criteria. The variables included in the study were of two types: independent or dependent. Independent variables included lesional agent (firearm, explosive), and the affected anatomical area (head-neck, thorax, abdomen, upper limbs and lower limbs). Dependent variables included mortality (exitus, alive), need for surgical intervention (yes, no), need for anesthesia (general anesthesia, regional, local, sedation), need for admission to intensive care unit (yes, no), severity according to the scale score (quantitative variable, New Injury Severity Score NISS), need for blood products (packed red blood cells, fresh frozen plasma, frozen platelets), telemedicine consultations, and socio-demographic and control factors (gender, age and civilian/military). The material used to measure these variables was a record sheet for data collection and the anatomical score. The variables were evaluated by reviewing the medical records of all patients admitted to in the Spanish Role 2E from March to May 2014. Finally, health assistance material was described based on the available resources in the Role 2E pharmacy. Appropriate military authorizations were obtained to carry out the study. Seven hundred and forty five patients including 181 Afghan civilians, 82 non-Afghan civilians, 24 Afghan police and military, and 458 military ISAF, were treated during the study period. There were 10 male combat casualties them aged 25 - 30 years. Seven casualties had been injured by explosive and three by firearm. Five had head-neck wound, two had wounds in the upper limbs, two in the abdomen, one in the thorax, and one in the lower limbs. NISS was one mild, five moderate and four severe. There were 14 surgical patients, seven wounded in combat and seven non-combat casualties (Table 1), and 12 patients were admitted to the ICU. None of them had major complications or died in Role 2E. A total of 12 general anesthesias, 11 regional anesthesias (three intradural anesthesias, three interscalene blocks, one axillary block and four femoral blocks) and six local anesthesias with sedation were performed (Table 2) (Figures 2 and 3). During the 60 days of the study, two logistic flights were dispatched from Spanish territory. The supply of blood units was constant (94 units of packed red blood cells -50% O+, 25% A+, and the remaining 25%: A-, B+, O-, 18 units of fresh frozen plasma - 100% AB - and six units of frozen platelets). In addition, the US medical service provided units of packed red blood cells on a weekly basis from the operation area (22 units of packed red blood cells -90% O+, 10% O- in each flight). In the course of the study, 18 units of packed red blood cells, six units of fresh frozen plasma and three units of frozen platelets were used, all from the Transfusion Centre of the Spanish Armed Forces. It should be also noted that nine telemedicine consultations were done with the Gómez Ulla Central Hospital of Defense (Role 4); one for plastic surgery, one for maxillofacial surgery, three for pediatric surgery, two for radiology, one for equipment testing, and one for research and development. aAbbreviations: GA, General Anesthesia; RA, Regional Anesthesia; LA, Local Anesthesia; S, Sedation. bFour times in Operation Room. The participation of the health assistance branch of the Spanish military in different areas of operation during the past three decades is very interesting. There are several studies analyzing surgical experiences in conflicts such as those in Bosnia-Herzegovina, Albania, Iraq or Afghanistan, and humanitarian support after natural disasters in Central America, Turkey, Indonesia, and Haiti (4, 5). We review some of the most important aspects of perioperative medicine at the military level were reviewed in the Operation Area. Total Intravenous Anesthesia (TIVA) is widely used in the military environment (Spanish Civil War, Second World War, the Falklands, the Persian Gulf War, the Balkans, East Timor, Iraq and Afghanistan); therefore, it is essential for the military anesthesiologists to do it proficiently (6). 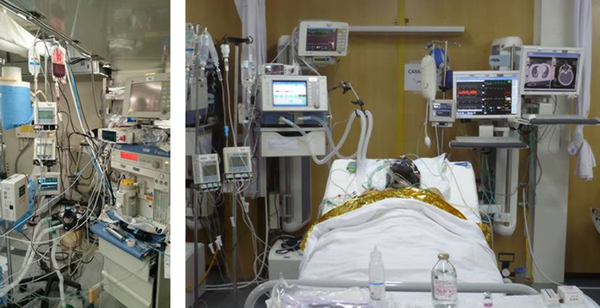 The main advantages of TIVA in the areas of operation are that it lightens the logistics footprint; only the infusion device ,a syringe, and the consumable system are needed, which are much lighter and easier to transport than an anesthesia tower, vaporizer, soda lime carbon absorbent, etc. ; improves the recovery ,although the awakening time is similar to the one used with volatile anesthetics such as desflurane; TIVA with propofol causes less nausea and vomiting, and fewer headaches resulting in a reduced care burden on the health care personnel; modulation of the response to stress (propofol decreases IL-6 and stress hormones); it cannot cause malignant hyperthermia since this disease is only associated with the use of volatile anesthetics; and finally it allows the postoperative continuity of anesthesia with the option of using the same drugs in the case of evacuation to rear echelons (6, 7). Grathwohl discussed the anesthetic technique used in 214 combat casualties with head trauma, concluding that TIVA does not produce higher neurological outcomes than inhalational anesthesia (8). Target-controlled infusion (TCI) is an anesthetic infusion technique that employs a pharmacokinetic model of propofol and maintains the concentration of the hypnotic agent (9). Harding described the experience of the Health Assistance branch of the Australian Military deployed in Timor using TCI (10). He concluded that the method produced similar results to those obtained with volatile anesthetics but believed that the logistical advantages should be taken into consideration during deployments in the areas of operation. General inhalational anesthesia and intraoperative anesthetic maintenance with inhalational agents are the most used technique in armed conflicts since the late nineteenth century and into the twentieth century (11). Throughout this time, the front has used inhalational anesthetics as they are synthesized. Although regional anesthesia and TIVA are very common, many military anesthesiologists believe that the latter is not the most suitable technique for the initial anesthesia of casualties with hypothermia, in hemorrhagic shock and with coagulopathy. In addition, when administering TIVA it is advisable to use Bispectral index monitoring to prevent intraoperative awareness; the infusion pumps require maintenance, propofol can cause rhabdomyolysis; and finally, it is essential to have venous access. In comparison, general anesthesia with volatile anesthetics has the advantage of lower intraoperative awareness and anesthesiologists commonly benefit from more training and are more experienced in it. It is obvious that its logistics are more complicated, it requires more material, it is mandatory to have a reliable power source, and it is more expensive. However, several authors consider portable anesthesia equipment such as Triservice Apparatus (TSA), Universal Portable Anesthesia Complete (UPAC) or Oxford Miniature Vaporizer (OMV) as much lighter and simpler alternatives that would make good use of personnel’s experience. The same authors postulate that today it is impractical to deploy an operating room on an area of operation without a generator capable of providing light, aspiration, monitoring, and mechanical ventilation. They add that their cost can be negligible compared to the total cost of a military operation (11-13). The use of regional anesthesia in the military environment is not new. During the twentieth century, subarachnoid and epidural anesthesias were used in hemodynamically stable patients undergoing surgical procedures in lower limbs. Furthermore, during the Vietnam conflict, femoral nerve block was common (14). With the development of new ballistic protection methods for the fighters, mainly helmet and vest, and the type of lesional agent used in the current conflicts in Iraq and Afghanistan, limb injuries have increased. These changes, in addition to the very common use of regional anesthesia in clinical practice, the improvements in neurostimulators, the needles used for nerve blocks, and lastly the fact that ultrasound imaging is often available in the front resulted in a marked increase in the performance of this regional technique in the military environment (15, 16). The main advantages of peripheral regional anesthesia in the military environment are the ability to obtain excellent perioperative conditions, profound analgesia with hemodynamic stability, specific anesthesia for the injured limb, less need for other anesthetics, elimination of the use of opioids, improved postoperative safety, minimal adverse effects, faster recovery from anesthesia, easy performance, simple logistics, and good cost-effectiveness (17-19). From a historical standpoint, a compromised airway is the third major mechanism of potentially preventable death in the operation areas after hemorrhage and tension pneumothorax. Specifically, it is estimated to cause 1.8% of all deaths in combat (20). In most cases, lesions that compromise the airway result from the association of wounds on the face and neck with significant soft tissue lacerations and multiple facial fractures caused by firearms and improvised explosive devices (21). Endotracheal intubation by laryngoscopy remains the method of choice to isolate the airway in a military hospital deployed in an area of operation (22). However rescue devices are described as the combitube (23), laryngeal mask (24), airtraq (25) and fiberoptic bronchoscopy (26). It is noteworthy that Cricoid puncture is postulated as the technique of choice if the patient with a compromised airway presents facial anatomical alterations secondary to gunshot wounds or explosives that prevent the use of the above devices (27). Hemorrhage is the leading cause of preventable death in combat. Therefore, it is vital to control it, and several different types of devices (tourniquets), topical haemostatic products, drugs, and massive bleeding protocols are developed to perform this mission (28). In the recent years, many tourniquet devices are developed. Such devices can be applied to the wound or at the root of the injured limb. The installation time must be written down and its removal needs to be assessed once adequate hemostasis is reached. In combination with the tourniquet, topical haemostatics from the primary treatment of bleeding control. It is the first line treatment in cases whereby the bleeding appears in an anatomical area where the use of the tourniquet is contraindicated (neck, chest, etc.) (28). There are a variety of hemostatic products. Most of them are poured directly onto the wound, but sometimes an applicator can be used, then it is recommended to apply pressure to the wound. One of the lessons learned from the front is that newer hemostatic products minimally hinder the surgical practice for surgeons, allowing the final resolution of the bleeding in the operating room (29). Early administration of procoagulant drugs ( fibrinogen, calcium chloride, prothrombin complexes, clotting factors, and recombinant factor VII), antifibrinolytic agents ( tranexamic acid), and the use of a massive bleeding protocol (one unit of packed red blood cells: one unit of fresh frozen plasma: one unit of platelets; although this ratio is still under discussion) can shape the foundation of massive bleeding treatment in the military casualty (29). Military medicine experience has formed a new treatment concept of severe trauma called damage control resuscitation. It was developed after studying the deadly triad that can occur after trauma and includes acidosis, hypothermia, and coagulopathy. This concept encompasses permissive hypotension, hemostatic resuscitation, and damage control surgery, aimed to reverse the lethal triad: it should begin at the scene of the incident, continue in the triage room, be maintained through surgery and continued in the intensive care unit (30). Morrison investigated acidosis, hypothermia, and perioperative coagulopathy in 51 British combat casualties treated at the Camp Bastion Role 3 (Afghanistan) (31). He showed that the traditional view may not be true, once the deadly triad starts in the patient it is exacerbated during surgery, since early treatment guided by the objectives normalized physiological parameters in such casualties. Maintenance of this treatment, simultaneously to surgery, is essential to achieve an early recovery of the physiological changes caused by the combat casualty. Analgesia plays a major role in military medicine. Today, it remains a medical, tactical, and logistical challenge in the comprehensive treatment of the combat casualty. Most military health assistance directorates advocate for a progressive treatment based on pain intensity ,measured by some analgesic scales, and on the location of different medical echelons (first, second, third, and fourth) (32). At the pre-hospital level, one can readily find intramuscular morphine auto-injectors (10 mg vial) and oral transmucosal fentanyl applicators. Morphine, fentanyl and remifentanil are drugs normally used in all medical echelons. In addition, based on its pharmacological characteristics, ketamine can still be suitable in the military environment. Several studies show that early pain control by a multimodal analgesia, the use of peripheral nerve blocks, and adjuvant drug therapy reduce the incidence of chronic pain, posttraumatic stress, and the onset of phantom limb in military casualties (33, 34). It is considered that all injuries in the military environment are dirty. This is the reason why any and all casualties are prophylactically treated with antibiotic (35). Depending on the geographical area where the military contingent is deployed, the anatomical area affected and the lesional agent involved, different antibiotics are used. For example, the US military uses prophylactic cefazolin (2 g/8 h IV) plus metronidazole (500 mg/8 h iv) in the case of abdominal, esophageal or head injuries (36). The British Army guidelines recommend amoxicillin-clavulanate (2 g/8 h IV) as a prelude to the results of the cultures. Once the casualty reaches its Role 4, meropenem is to be administered (2 g/12 h IV) and antifungal to be considered if the casualty arrives from the agricultural areas of southern Afghanistan, Helmand, if the lesional agent was an improvised explosive device, or if the patient required massive transfusion (37). From the outset, irrigation and wound washing is also recommended in the military environment (38). The monitoring of a casualty in a military environment should have at least the minimum medical standards of the country of origin. On the other hand, it is influenced by the particularities of combat deployment such as limited resources, hostile environment, climate, temperature, humidity, dust, etc. Furthermore, many casualties present very robust defense pathophysiological mechanisms that are able to maintain hemodynamic parameters such as heart rate or blood pressure stable until a collapse appears. Virtually all military medical facilities have basic monitoring, SaO2, ECG and non-invasive blood pressure -NIBP-; however, medical information obtained from it may not be complete and may be incorrect, pulse oximetry may not be feasible in patients with shock, which can cause artefacts by hypothermia or by CO poisoning; ECG sensor adhesion can be difficult, and NIBP values in a patient with hypovolemic shock may be wrong. However, analytical monitoring with parameters such as base excess, lactic acid, and tissue oxygen saturation themselves are variables that more realistically analyze the status of the combat casualty (39). A culture of patient safety is essential both in a civil and a military environment. Well-established procedures must be followed and limits and authorities must be clearly defined in order to reduce the errors (40). Recent recommendations on the safety of surgical patients establish the necessity to perform a check of the equipment, various auxiliary devices, drugs and antidotes prior to any surgery. This need is paramount in trauma and emergency situations. Tobin discusses the need for checklists in anesthesia to improve the management of multiple trauma and emergency surgery patients (41). Despite all these safety measures, the death of a combat casualty due to local anesthetic toxicity is reported (42). From a tactical point of view, the presence of attacks while combat casualties were being intervened in the operating room is noteworthy (43, 44). At the completion date of this article, from 2005 to May 2014, 29245 patients (728 combat casualties) were admitted and 913 surgeries performed at Role 2E. Afghanistan was the operation area with the highest number of evacuations to the national territory (45). These nine years were served to gain important experiences, thanks to the integration with Bulgarian, the American, and Emirati teams. The training of medical evacuation teams were improved, new bleeding control developments were made (individual fighter kit, shipments of fresh frozen plasma and frozen platelets), damage control resuscitation was performed, telemedicine capabilities were implemented (airway control, telesurgery, regional nerve blocks), imaging technologies were used (ultrasound and CT) and various monitors (Invos®, BIS®, Masimo®) were tested in an area of operation with very positive results. During the study period, 745 patients were treated, including 10 combat casualties. Twelve general anesthesias, 11 regional anesthesias (three intradural anaesthesias, three interscalene blocks, one axillary block, four femoral blocks, and six local anaesthesias with sedation) were performed. Twelve patients were admitted to the ICU, 18 units of packed red blood cells, six units of fresh frozen plasma and three units of frozen platelets were used. Nine consultations were performed by telemedicine. The analysis of the surgical experience obtained during a rotation in the Role 2E in Herat (Afghanistan) was essential to improve the health support in this area of operation and in the planning of future deployments. 9. Military relevance of total intravenous anesthesia with Target Controlled Infusion. 3rd World Congress of Total Intravenous Anaesthesia &amp; Target Controlled Infusion.